An offer by the maker of the lifesaving medical device EpiPen to make a lower-priced generic version was criticized by U.S. Senator Richard Blumenthal as a marketing ploy. Mylan Pharmaceutical Company has hiked the price of EpiPen approximately 400 percent since 2009. Treatment for life-threatening allergic reactions is about to get a little cheaper. Mylan, the maker of the EpiPen, said Monday that it will launch a generic version of the device for half the price of the brand-name product. For people with really bad arthritis the idea of intentionally suffering bee stings is an easier sell than it is with the rest of humankind. Sometimes my knees hurt so bad, a bee sting would be a welcomed distraction. I mean, it couldn’t make things any worse and there’s something intuitive about the idea that our body’s natural response to the venom might actually counteract other problems. So, this hour, we talk about apitherapy. First, we explore the world of long-haul bee truckers. The nation’s farm depends on these peripatetic pollinators who cross the country and travel up and down the coasts. It’s a lot like other kinds of trucking and then it’s totally different. 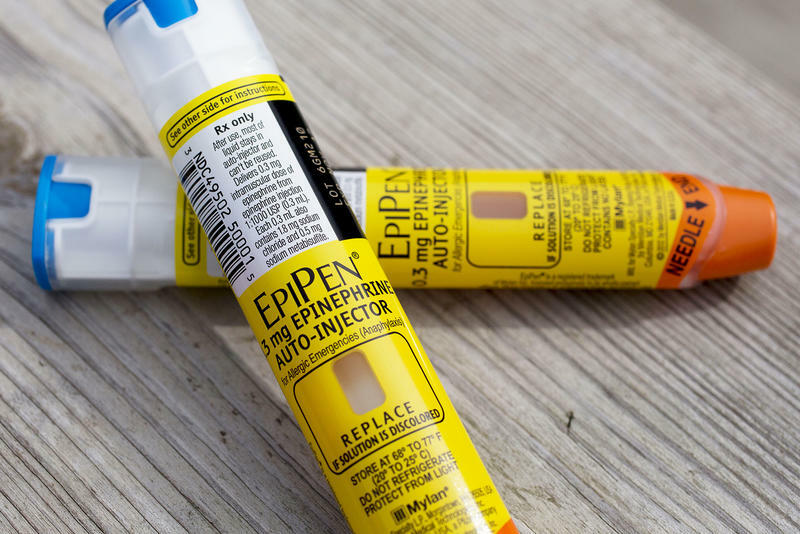 A bill that would allow schools in Connecticut to stock emergency medication for severe allergic reactions has been referred to the Appropriations Committee. Hundreds of advocates for prohibiting the storage of wastewater from hydraulic fracturing, or “fracking,” as it’s called, delivered petitions with over 5,600 signatures to lawmakers at a rally on Wednesday at the LOB. Though Connecticut doesn’t have the natural resource deposits to engage in the process of digging for natural gas, many fear that companies seeking to store the waste created by the process will make their way to into Connecticut from outside the state. They want Governor Dannel Malloy and lawmakers to prohibit it. Now that the long winter is over, spring is here. So is tree pollen. President Obama signed a bipartisan bill Wednesday that offers financial incentives to states if schools stockpile epinephrine. Epinephrine is the emergency medication considered the primary treatment for a severe allergic reaction, called anaphylaxis. For most of us, yellow jackets are a nuisance and for some people, they’re fatal. But for Norman Patterson, they’re more of an obsession. No one can escape the issue of extreme food allergies. Maybe it's you who is allergic to peanuts, dairy, shellfish, citrus. Maybe it's your little son or daughter. Or maybe you don't have any allergies, but because you eat food, you find that other people's allergies affect your life. Are you ever asked to keep peanuts out of the snack you're bringing to school? Or to keep dairy out of the cake you made for the office birthday party? Faith Middleton's Food Schmooze: High Protein Almond Flour, a Superfood? Elana Amsterdam is back on The Food Schmooze. Her book of recipes using high protein almond flour in place of white flour was a hit with us and our regular Food Schmooze listeners. So we invited Elana to join us again to talk about some of her recipe ideas. We'll tell you all about why blanched almond flour is considered a superfood by some; how it differs from white wheat flour and how it registers on the glycemic index.